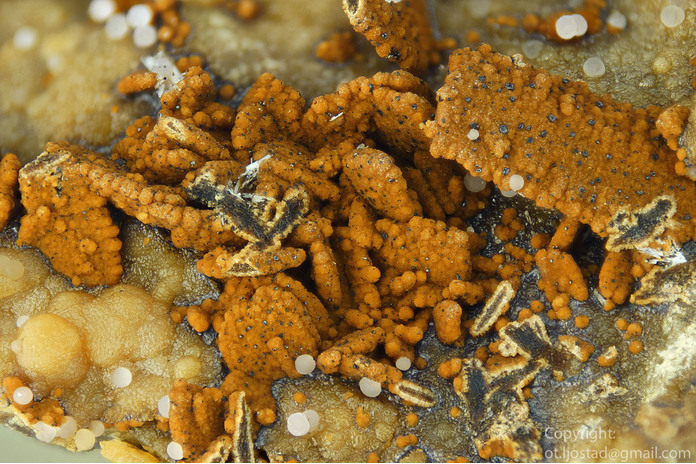 Caryopilite: Mineral information, data and localities. Brusnitsyn et al. (2000) suggest the formula Mn5(Si2O5)2(OH)6. Named in 1889 by Axel Hamberg (1889) from the Greek, χάρυον = nut, due to its brownish color and habit + πίλος = felt, due to its appearance like a feltlike mass in thin sections. 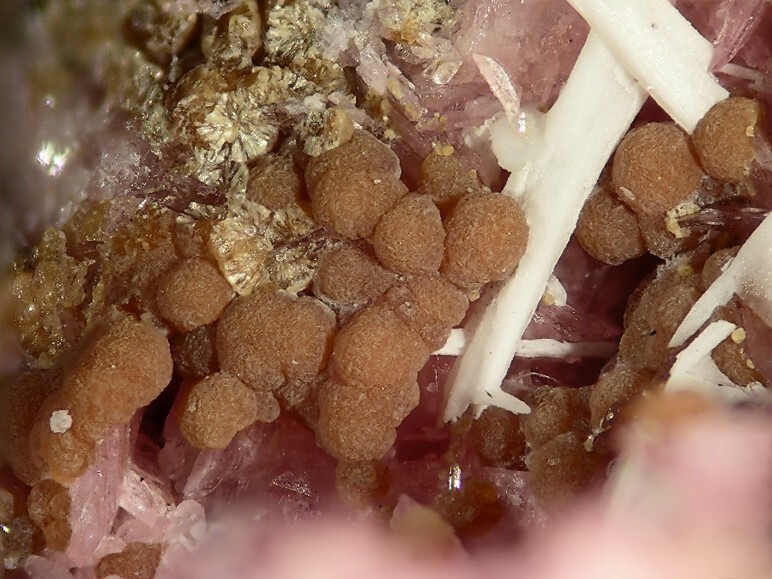 This page provides mineralogical data about Caryopilite. Probably monoclinic; space group not determined. Rhodochrosite 13 photos of Caryopilite associated with Rhodochrosite on mindat.org. Calcite 12 photos of Caryopilite associated with Calcite on mindat.org. Willemite 9 photos of Caryopilite associated with Willemite on mindat.org. Tephroite 9 photos of Caryopilite associated with Tephroite on mindat.org. Copper 6 photos of Caryopilite associated with Copper on mindat.org. Shigaite 5 photos of Caryopilite associated with Shigaite on mindat.org. Andradite 5 photos of Caryopilite associated with Andradite on mindat.org. Baryte 5 photos of Caryopilite associated with Baryte on mindat.org. Quartz 5 photos of Caryopilite associated with Quartz on mindat.org. Franklinite 5 photos of Caryopilite associated with Franklinite on mindat.org. Dunn, P.J., Peacor, D.R., Nelen, J.A., Norberg, J.A. (1981): Crystal-chemical data for schallerite, caryopilite and friedelite from Franklin and Sterling Hill, New Jersey. American Mineralogist 66, 1054-1062. Guggenheim, S., Eggleton, R. A. (1998): Modulated crystal structures of greenalite and caryopilite: a system with long-range, in-plane structural disorder in the tetrahedra sheet. Canadian Mineralogist 36, 163-179. Brusnitsyn, A. I., Starikova, E. V., Shchukarev, A. V., Chukanov, N. V., Kalinina, O. G. (2000): Caryopilite from Kyzyl-Tash manganese ore deposit (the South Urals). Zapiski RMO (Proceedings of the Russian Mineralogical Society) 129, 108-118 (in Russian). The following Caryopilite specimens are currently listed for sale on minfind.com. Abrecht, J. (1990): An As-rich manganiferous mineral assemblage from the Ködnitz Valley (Eastern Alps, Austria): Geology, mineralogy, genetic considerations, and implications for metamorphic Mn deposits. Neues Jahrbuch für Mineralogie, Monatshefte 1990, 363-375. Moriyama, T., Miyawaki, R., Yokoyama, K., Matsubara, S., Hirano, H., Murakami, H., and Watanabe, Y. (2011): Wakefieldite-(Nd), a new neodymium vanadate mineral in the Arase stratiform ferromanganese deposit, Kochi Prefecture, Japan. Resource Geology 61, 101-110. Sameshima, T., & Kawachi, Y. (1991). Coombsite, Mn analogue of zussmanite, and associated Mn‐silicates, parsettensite and caryopilite, from southeast Otago, New Zealand. New Zealand Journal of Geology and Geophysics, 34(3), 329-335.
http://www.issp.u-tokyo.ac.jp; Daisuke Nishio- Hamane, Norimitsu Tomita, Tetsuo Minakawa, and Sachio Inaba (2013) Iseite, Mn2Mo3O8, a new mineral from Ise, Mie Prefecture, Japan. ￼Journal of Mineralogical and Petrological Sciences, 108, 37─41. Satoshi Matsubara (1981) Taneyamalite, (Na, Ca)(Mn2+,Mg,Fe3+,Al)12Si12 (O,OH)44, a New Mineral from the Iwaizawa Mine, Saitama Prefecture, Japan. Mineralogical Magazine 44:51-53. Yamada, S. (2004) Nihonsan-koubutsu Gojuon-hairetsu Sanchi-ichiranhyou (111 pp. ); Alfredo Petrov collection. Kato, A. (2010) Ordinary Meeting of Mumeikai Group No. 30, 488. Hirata, D. & Kato, A. (1993): Siegenite in a caryopilite ore from the Okutama mine, Tokyo. Bull. Kanagawa prefect. Mus. (Nat. Sci. ), No. 22, 25-32. 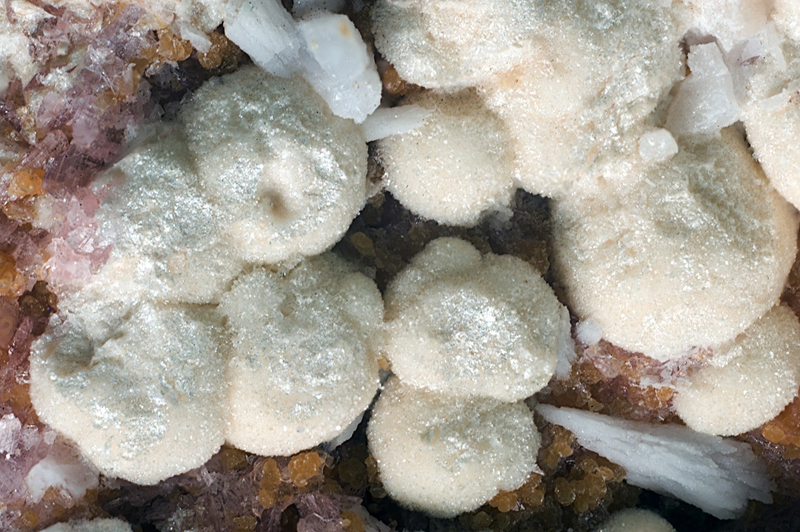 Brusnitsyn A. I., Starikova E. V., Shchukarev A. V., Chukanov N. V., Kalinina O. G. (2000): Caryopilite from Kyzyl-Tash manganese ore deposit (the South Urals). Zapiski RMO (Proceedings of the Russian Mineralogical Society) 129, 108-118 (in Russian). Econ Geol (1992) 87:2023-2040; Huebner, J. Stephen; Flohr, Marta J. (1990) Microbanded manganese formations; protoliths in the Franciscan Complex, California; USGS Professional Paper 1502.